In the middle of a very emotive referendum, my debut novel has abortion as a theme. In the middle of the referendum vote, my debut novel has abortion as a theme. My first crime fiction novel, The Abandoned, was published in January of this year and launched at number one on Kindle, Irish Crime Fiction. I never thought I would get published (never mind have a novel about an Irish back-street abortionist). I’m delighted at becoming an author, but the nation is in turmoil about a topic in my novel! I worry about how to deal with this. Peggy Bowden strode into my brain and set up camp on my keyboard, willing me to tell her fictional story. I researched criminal women of the 1950s and she merged from their lives and suddenly she was with my agent and published by Bloodhound Books UK. When I started this novel, I had no idea Ireland would go where it has. Years ago, Peggy and I, started our journey together. I was even told to stop writing her story, as it would never be accepted in Ireland. But, Peggy stuck with me. We believed in each other. Coming up to the referendum, despite my own opinions and my book needing promotion, I stayed quiet. As Ireland goes to the polls to vote to repeal the 8th amendment to our constitution, my emotions are high again. I wish to be respectful of the decisions being made, and want to be understanding about the emotions people feel. I don’t want my novel trashed by people with moral and political opinions. I don’t want to be accused of selling my book on the back of people’s pain and personal stories. Whatever way the vote goes or how my book is accepted – abortions happen. No matter what vote wins today, as women make decisions for themselves and their families, they will need understanding from the people around them. That will never change. Of course, Peggy is fiction and there are many real stories out there. My novel is not to hurt, condemn or diminish anyone’s experiences, feelings or beliefs. However, with the 25th May almost behind us now, I feel that I am able to mention ‘The Abandoned’ again, with pride. 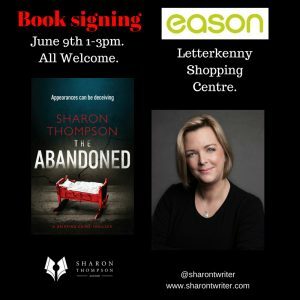 ‘The Abandoned’ is described as a crime thriller and is about Peggy Bowden a backstreet abortionist and brothel owner in 1950’s Dublin. Peggy Bowden has not had an easy life. As a teenager, her mother was committed to an asylum and then a local priest forced her into an abusive marriage. But when her husband dies in an accident Peggy sees an opportunity to start again and trains as a midwife. In 1950s Dublin it is not easy for a woman to make a living and Peggy sees a chance to start a business and soon a lucrative maternity home is up and running. But when Peggy realizes that the lack of birth control is an issue for women, she uses their plight as a way to make more money. Very soon Peggy is on the wrong side of the law. What makes a woman decide to walk down a dark path? Can Peggy ever get back on the straight and narrow? Or will she have to pay for her crimes? Set against the backdrop of Ireland in the 1950’s The Abandoned tells the story of one woman’s fight for survival and her journey into the underbelly of a dangerous criminal world. “An engrossing story which is so hard to look back at and think that things like this really happened not that long ago. A superb debut.” Susan Hampson – Books From Dusk Till Dawn. “The perfect mix of Historical Fiction, Thriller, Suspense, and Crime. I’m excited to read more from Sharon Thompson.” Dash Fan Book Reviews. “Gripping, emotive, raw, and compelling are just some of the adjectives I could use to describe this stunning debut that will take your breath away.” Linda Green – Books Of All Kinds. I would appreciate people making their own mind about my book. If you enjoy it as fiction, please leave me a review on Amazon or Goodreads and tell your friends about ‘The Abandoned’. It is available online and also is in First Chapter Super Valu in Carndonagh, Liber Bookshop Sligo, Farrens Newsagent Moville and both Eason bookshops in Letterkenny. On June 9th from 1-3pm, I will be in Easons in Letterkenny Shopping Centre (near the bus station) doing a book signing. I would love to meet people and speak to you then.